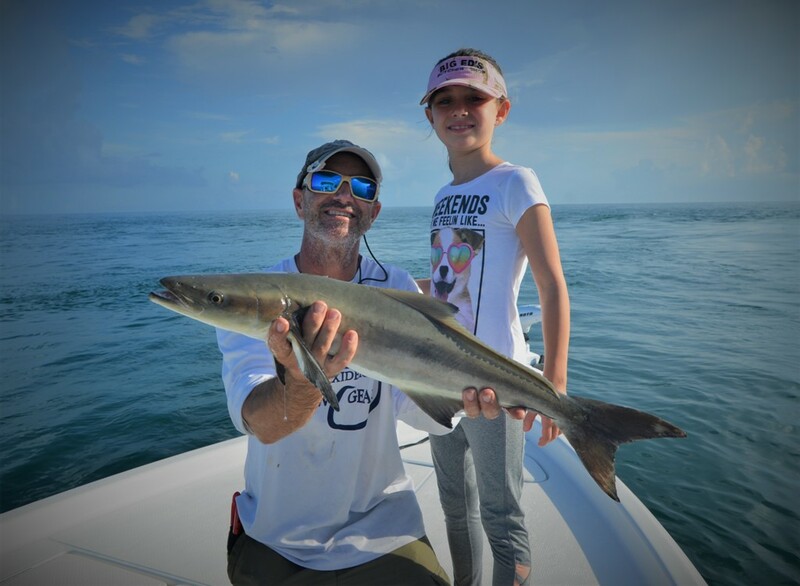 Fishing this week remains strong for Snook, redfish, Seatrout, Jacks, & Tarpon. Freelined mullet is still going to be the bait of choice as we are approaching the tail end of the mullet run. Fishing around structure will be best for Snook & reds. Open water with shallow grass flats will yield more trout. Deep water bends or channels will be a great place to soak a large mullet for a bigger tarpon. Shrimp fishing remains strong when bottom fishing around structure. You can expect plenty of snapper, redfish, flounder, ladyfish, sheepshead, blackdrum, & some pompano in the mix. Spanish mackerel are starting to make a showing off local beaches & nearshore reefs. Also plenty of Jacks, pompano, snapper, sheepshead, bluefish, & even a few permit. Fishing jigs or spoons will work best for macks & blues. Shrimp or crabs will work for a variety of other critters when doing this style of fishing. Bonitas are around in full force, just look for crashing water, cast a spoon or jig into the middle of the breaking water & hold on! Make sure to get them in quickly as the sharks aren’t far behind. With approaching cold fronts & north winds, our main focus should be mahi & sails. Trolling ballyhoo in depths of 80-150′ will more than likely produce a box full of dinner. Also mixed in are plenty of cobia, blackfin tuna, bonita, kingfish, & a few wahoo. If the trolling isn’t red hot or the action seems to have leveled off, switch gears and break out the bottom rods. 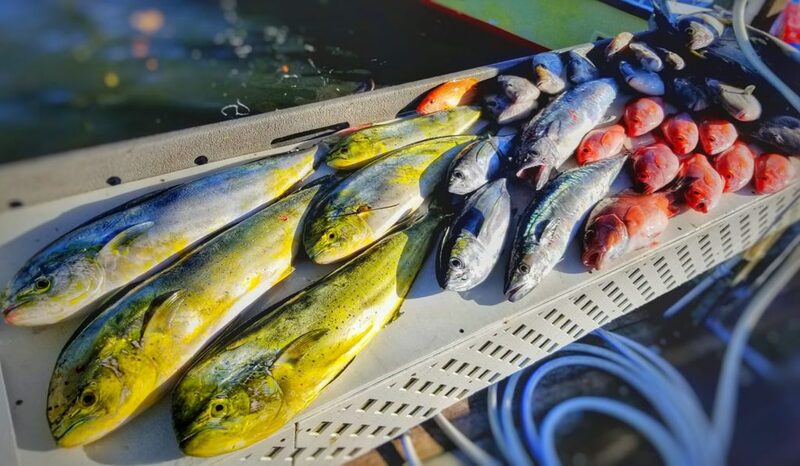 Bottom fishing has been good using chicken rigs with squid on the 6 & 8 mile reef for snapper, cobia, kingfish, porgies, grunts, grouper, & black seabass. Inshore, Nearshore, & offshore Report. Click to read full report with photos. 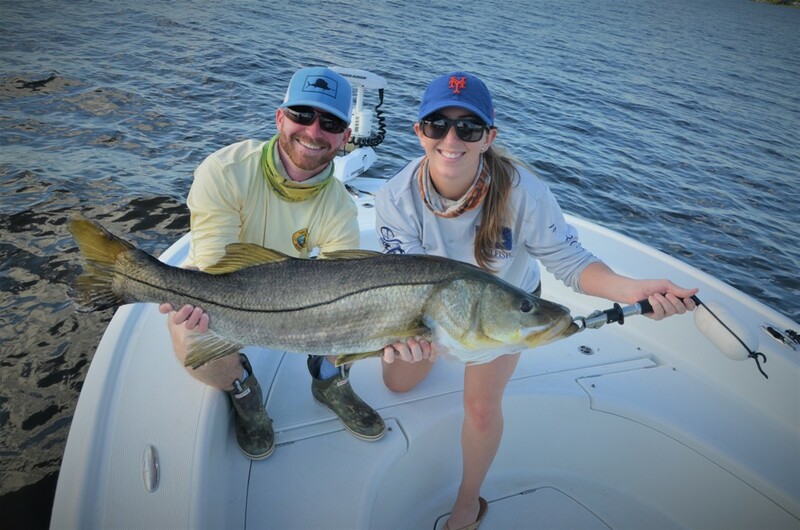 Fishing inshore this week has been stellar for snook(28″-32″ slot size. 1 per person.). Clients this week have all been targeting & catching personal best snook. Mostly fishing larger live baits around our St. Lucie inlet. Biggest caught by clients this week is 43″ so far. Keeper size fish have also been plentiful. Again using live bait near structure has been an ideal way to target these keeper sized snook with great success. Redfish are lingering around if you know where to look. Fishing a shrimp on a jig head is your best bet. Snapper fishing has been steadily improving with snappers commonly being legal size to keep(5 per person, 10″ min size when fishing inshore). Mullet are starting to make an appearance but the run is not in full swing yet, in the next few weeks we can expect the annual migration of large schools of mullet through our region. Nearshore action should start to heat up soon. North winds will start to drive down lots of Spanish Mackerel, Bluefish, Jack crevelles, & ladyfish. Nearshore reefs are great spots to stop and bend the rods with steady fish catching action. Nearshore wrecks will still be holding some kingfish, cobia, snapper, and a few goliath groupers. Tarpon will be along the beaches chasing schools of mullet as the annual mullet run starts this month. This week offshore the main focus will be snapper & mahi. Snapper fishing around 6 & 8 mile reef has been excellent for mutton, mangrove, lane, & vermillion snappers when bottom fishing. If trolling is more your speed then zip out to depths of 120′ or greater and set out a nice ballyhoo spread around or along a nice condition such as a weedline, current edge, and or color change. Trolling at 4-6 knots is ideal for covering ground and catching mahi. If you come across a large school of mahi simply stop the boat and cast at the school & keep one mahi in the water close to the boat to keep the school of mahi near the boat until you have caught your limit. You can also expect a few Sailfish, kingfish, wahoo, & blackfin tuna in the mix as well while trolling.